Please Take Note: This is a review of the final game, but it might change slightly based on the success of the Kickstarter campaign. The game is being reviewed on the components and the rules provided with the understanding that “what you see is not what you might get” when the game is published. If you like what you read and want to learn more, we encourage you to visit the game’s web page or visit the Kickstarter campaign. Now that we have all that disclaimer junk out of the way, on with the review. Teach the mortals why gods should be feared! Monstrous, designed by Kim Brebach and to be published by Secret Base Games, will reportedly be comprised of 60 Monster cards (in 5 different colored Monstrous decks, each containing 12 mythical monsters that are ready to wreak havoc), 12 Location cards, 8 Legendary Monster cards, 10 Kraken Tentacle cards, 5 Turn Sequence cards, 5 God boards, and 56 Faith tokens. A “Lighting Rules” book will also be provided, which is intended to get new players familiar with the game as quickly as possible. As this is a review of a prepublished game, I will not comment on the game component quality. 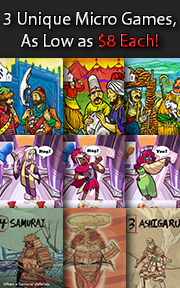 The illustrations included with the game were provided by no less than 6 talented artists (maybe more). Those credited for their work include Jeff Brown (II), Ben Nelson, Jarrod Owen, R. J. Palmer, John Silva, and Sutthiwat. Each monster and location is colorful and detailed, bringing to life (figuratively speaking) the game. Note: Monstrous can be played with 2 to 5 players or with up to 8 players with team play. Explained here is the basic game, which is suggested for new and inexperienced players. Team play and other game variants are summarized below in the “Game Variants” section of this review. To set up Monstrous, first place all the Faith tokens within easy reach of all the players. This is referred to as the “Faith Pool”. I suggest you put them in a bowl or a small bag to make it easier to pass and to keep your playing area clear. In fact, keep the Faith tokens off the playing area. Second, give each player 1 God board and matching colored Turn Summary card. The God board should be placed on the edge of the playing area, “Location” side face-up. The other side lists all of the Monster cards and their abilities. Third, give each player 1 of the 5 different colored decks of Monster cards (12 cards per deck). The Monster deck color should match the player’s God board color. Fourth, one player (the rules suggest the youngest player) now shuffles their Monster cards, cuts the deck, and then draws 1 Monster card per player in the game. When drawn, the Monster card is placed face-up in the middle of the playing area. All subsequently revealed Monster cards are placed next to it to create a row. The order in which the Monster cards are drawn is important. Fifth, all other players now go through their Monster deck and remove the same Monster cards in the same order as the original row was drawn. The first Monster card drawn is placed on top, with the second card drawn directly below it and so on. The removed Monster cards are placed vertically to the right of the player’s God board. This area is referred to as the “Underworld” (it’s actually labeled as such). These monsters may or may not come into play during the game. The original player to determine which Monster cards are placed in the Underworld takes their revealed Monster cards and places them in the Underworld, as well. Sixth, all players now shuffle their remaining Monster cards. This is the player’s Monster draw deck for the duration of the game. Players place their Monster draw deck horizontally to the left of their God board. When done, the player’s area will look similar to the following. Seventh, the Location cards are now selected. The Location cards used might be scenario driven, selected at random, or specifically requested by name. The first Location card is placed in the middle of the playing area. The other four Location cards are placed around the center Location card, approximately 1 Monster card’s width away in a symmetrical pattern. Selected Location cards might have additional rules and set up steps. Eight, organize the rest of the game components off to one side of the game playing area. This will include additional Location cards, Tentacle cards, and Legendary Monster cards. That’s it for game set up. Each player now draws 3 Monster cards from their draw deck to create their starting hand. Time for some vengeful god-like wholesome fun. Monsters are creatures of legend, myth, and horror. They are mighty strong and mighty stupid. They will attack foes and friends alike with no sense of loyalty. What little control a player has over them is restricted to simply loosing them onto the mortal world from up on high. Monster cards have 2 sides: Common and Unique. The side that is face-up when the card comes to rest after it’s tossed represents the Monster card’s currently available abilities and powers. Whatever is listed must be used where applicable, even if it means damaging the player’s own Monster cards in the process. Some monsters have abilities and powers that are triggered when they are attacked. These Monster cards are considered defensive and are commonly referred to as “Trap” monsters. Most monsters, however, focus all their attention in their attack when thrown by the player. Legendary Monster cards are almost identical to the other Monster cards, but they are far more powerful. Legendary Monster cards are used in games when players are looking for a bigger challenge. Think Kraken. 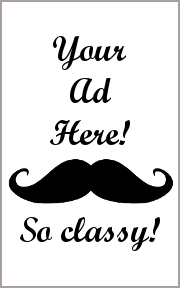 Sorry, no artwork to share. The Location cards represent the cities, towns, and lands where the poor people who lost faith in Zeus are about to get a nasty surprise. By sending terrible monsters to eat and destroy these locations, the people who live in them will again fear and respect the gods. Thus faith is restored, if not love. The Locations cards are the players’ primary target. They earn the most Faith tokens, but do not always provide the best opportunity to obtain an advantage. The Monster cards aimed at the Location cards will begin to battle each other and clutter up the area, making each Location card more difficult to get to as the game progresses. Like “Trap” Monster cards, the Location card has an effect that is triggered when it’s hit. This is in addition to any Faith tokens the player gains from the Location card. Monstrous is played in turns with no set number of turns per game. A player’s turn is summarized here. If a card should land outside the boundaries of the playing area, it’s sent to the Underworld (discarded). Otherwise, the player’s turn continues. When a Monster card comes to rest, a quick inspection of its edges is required to determine what it has hit. 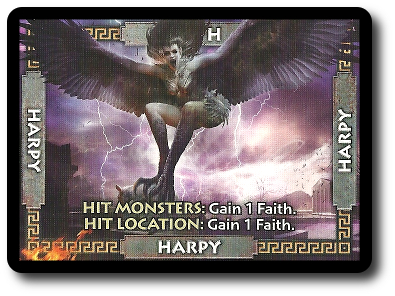 A “hit” is recorded if the thrown Monster card’s edge is visibly over or under laying some other portion of another card. Emphasis here is on “visibly”. Players cannot move the cards in the location area. If the hit is not visible, it’s not counted. Think of it like a pile of monsters. The player’s monster might be on top, but the more Monster cards that are beneath it, the harder it becomes to easily determine who is on top of what. Expect a few disagreements during this step as players argue if a Monster card is or is not touching something. Believe me when I say it really matters. This is perhaps the most involved portion of the game, as a single Monster card can trigger multiple effects. In total, there are 3 effects to investigate in the sequential order given here. After determining what cards are hit, the player looks for Monster cards that hit back first. These Monster cards are commonly referred to as “Trap” monsters. The name of the Monster card will be in red making them easy to spot, as well. 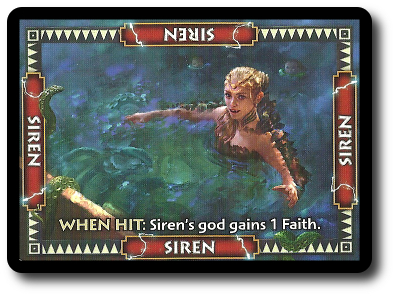 The “Siren” Monster card is a good example. This nasty Monster card earns its master additional Faith tokens each time it’s hit, making it a target best to avoid and a Monster card to strategically place. If the player’s Monster card is still in play (it can be removed before it can do any damage), the effects of the hit are now resolved. Depending on the Monster thrown, its power and its current facing (Common or Unique) will either hit just 1 Monster card or several. Some Monster cards cannot use their abilities or powers until certain criteria are met. Faith tokens might also be earned or Monster cards might be discarded. The effects are as different as the many monsters in the game. 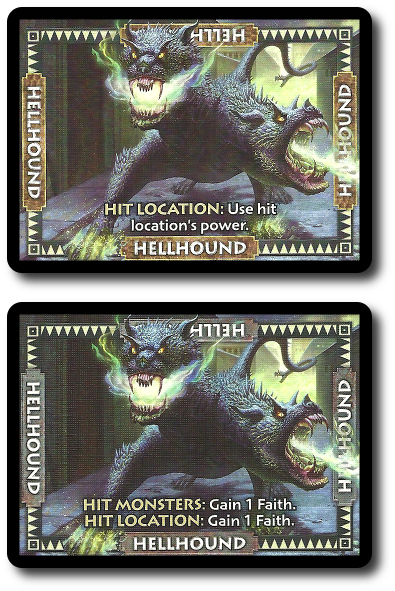 If the player’s Monster card also hits a Location card, the player reads the Location card’s effects. If Faith tokens are earned, they are collected from the Faith Pool and placed in front of the player. If the player has earned an extra throw, they do so now. The steps are repeated above. A player can only throw a maximum of 3 times per turn (in almost all cases), but what Monster cards they throw is up to them. When the player has thrown their 3 Monster cards or has not earned another throw to continue, their turn comes to an end. They draw 1 card from their Monster deck (if any cards still remains) and the next player in turn order sequence takes their turn. The game continues as described above until 1 player has no more Monster cards in their hand or in their Monster draw deck at the end of their turn. The endgame is then triggered. Each player is given 1 final turn to do as much damage as possible. When the last player completes their turn, points are counted. Each player determines their total Faith points by adding together the number values on their Faith tokens. Then the player subtracts 1 Faith point for every Monster card still in their hand, Monster draw deck, and Underworld. The resulting number value (which could be a negative number value) is the player’s final score. The winner is the player with the highest final score. Ties are broken by counting the total number of Monster cards hitting locations. Monstrous is very easy to modify and adjust. Lots of different ways to play means lots of different ways to be challenged. Summarized here are the majority of game variants provided in the rules. The game’s difficulty can be adjusted to accommodate younger players. Skill is still needed to play and to win, but a buffer is provided between the player and the game’s nasty penalties. 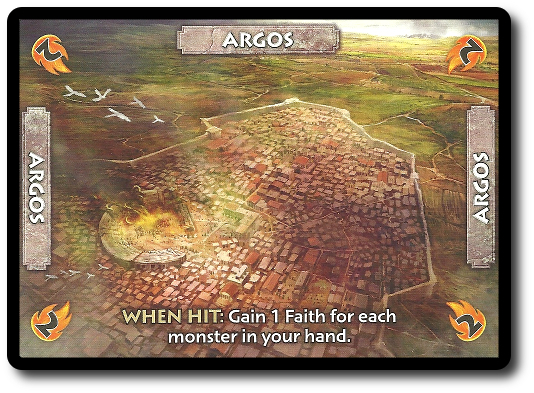 For examples, players start with 3 Faith tokens each. A Monster card that misses any other cards can be picked up and thrown again once per turn. Player can also, once per turn, spend a Faith token to rethrow a card that flies off the table, thus saving it from the Underworld. If the base game is considered too easy, the Legendary Monster cards can be brought into play. The Legendary Monster cards are used by all the players, meaning they only do the bidding of the player when they are thrown on the player’s turn. The “Kraken” Legendary Monster card can come into play if the “Olympus” Location card has been hit. When the Kraken appears, all the players get a Tentacle card, shout “RELEASE THE KRAKEN” and toss the Tentacle cards to the table. Any Monster cards struck by the Tentacle cards are dragged to the Underworld. Nasty. Several Monster cards are removed during game set up. Normally, this is done at random. For new and inexperienced players, it’s suggested that players remove specific Monster cards (based on the number of players in the game). Players are welcome to play with all their Monster cards and all the Legendary Monster cards if they like. No cards are removed based on the number of players. Games will be longer, but the epic carnage will be bigger. Scenarios can be used that build the basis of the game set up and victory conditions. 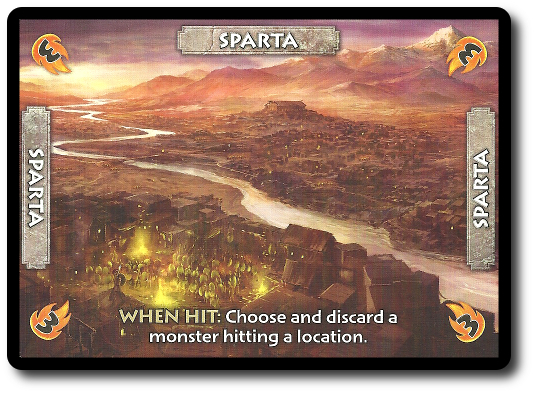 For example, playing with Tartarus as the center Location card. Players can make up their own scenarios, as well. Normally, a game can only hold up to 5 players. Team play allows up to 8 players to join in the fun. Each team should have no more than 2 players each. 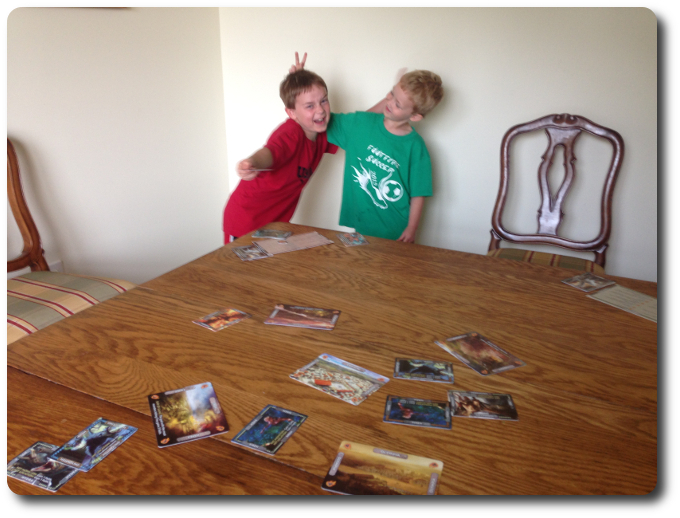 Movement around the table and tossing cards is the same as the base game. Each team takes 1 Monster deck and divides it evenly among both team members (6 cards each). Team members throw their Monster cards together, but get to decide in what order the throws are resolved. Since a team shares all their Faith tokens and the Underworld, it might behoove team members to talk it through. The game ends when a team runs out of cards. The other team does not get to take a final turn. Points and victory are determined in the same way as the base game. 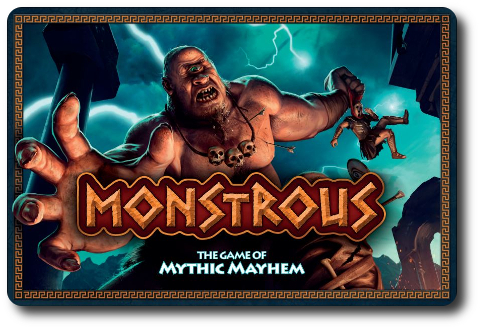 If a longer and more detailed game playing experienced is wanted, Monstrous can be played over multiple sessions. Location cards are swapped out based on winning player’s preference, but the decks of cards never change. Those Monster cards initially sent to the Underworld, always start in the Underworld at the beginning of each game. The only exception is that the winner of a round can swap a Monster card in their draw deck with a Monster card from their Underworld, and then do the same thing to their opponents. Points are calculated and recorded for each game played until all the games are finished. The player with most points after all the games wins. To learn more about Monstrous, visit the game’s web page or visit the Kickstarter campaign. The Child Geeks had a blast playing Monstrous. They quickly learned the game and started to pulverize the mortals who lived on the gaming table. One very excited Child Geek said, “I feel like I am a huge god throwing monsters!” Which is the point of the game, I believe. Another Child Geek said, “The game is really easy to learn, but you have to have some serious skills to throw the cards!” Very true on both accounts. The game’s rules are light, but the game play is anything but a walk in the park. Players will be challenged to place their Monster cards in specific locations and at the right time in order to get the most out of the monster they unleash. None of the Child Geeks had a bad time and they wanted to play the game again and again. With such a short game play length, they could and did. When all the games were over, the Child Geeks unanimously agreed to approve Monstrous. The Parent Geeks found the game to be a lot of fun, both with their Child Geeks and with their peers. Monstrous played just as well with a mixed group, too, with the Parent Geeks having no specific advantage over the younger and inexperienced players. In fact, I’m pretty sure the Child Geeks had a slight edge on their taller opponents since the Child Geeks were closer to the playing area. One Parent Geek remarked, “I feel like I’m a Greek God looking down on the world. This game is great for my ego.” Another Parent Geek said, “The game is wonderfully challenging and highly entertaining!” Each throw resulted in hand clapping, high-fives, and groans of dismay. When all the games were over, the Parent Geeks gave Monstrous their full approval. The Gamer Geeks, being familiar with Action/Dexterity games, knew that the best way to win was to position cards to make their opponent’s life difficult. This they did and the Gamer Geeks found Monstrous to be a game that was as much about attacking as it was about positioning. According to one Gamer Geek, “What I like about this game is that the Monster cards have so many uses. They are like little tools. I’ll play one to get a lot of Faith tokens and another to make sure that my opponents can’t do the same.” But the Gamer Geeks also found that strategy and tactics meant little if the player didn’t have the skill to place the card correctly. As one Gamer Geek put it, “This game has nothing to do with luck unless you just randomly throw a card – which would be dumb. You have to learn how best to toss your cards. If you know how to do that, the game is easily won.” Easily? Hardly. None of the Gamer Geeks ever “won big”. Victories were small and hard-won. When the games were over, all the Gamer Geeks voted to approve Monstrous, finding it to be a light game full of strategic and tactical game play. Not to mention a lot of swearing. Monstrous is just good fun. The game is easy to teach and fun to play, but by no means easy to play. It’s hard to say if luck beats skill in this game, but the chaotic nature of a flying card always leaves observers at the edge of their seats. This is a game that draws a crowd, makes a ruckus, and leaves most players feeling like they need to play another game to redeem themselves. Monstrous is the kind of game that you put out on the table when you don’t want to think too hard, but you need a challenge. I was sure that Monstrous would be enjoyed, but I was surprised by the level of enjoyment by all our groups. Honestly, this isn’t much of game. Monstrous is just a handful of cards and some slightly larger cards for targets. The entire game play is nothing more than dropping cards on the table. But my mistake was in thinking that the game’s only challenge was the dexterity aspect of the game play. Turns out that the different Monster cards are the keys to victory. The more experienced Gamer Geeks spotted this right away and the rest of our players quickly learned it. Placement of the cards was just as important as when the card was thrown. Add in the fact that each Monster card had a 50/50 chance of not only doing damage but UBER damage (based on the side showing), and the game was always interesting. Each card toss became exciting and menacing. The players ate it up. The biggest flaw (and only, now that I think of it) is that the game, ironically, needs more cards. After playing the game 3 times, the only thing that ever changed was the order in which the Monster cards were placed in my hand. I wouldn’t suggest that the game became boring, but the excitement level did drop due to being overly familiar with what the game was capable of. Randomly removing Monster cards helps, but its a gimmick of sorts. Easy enough to make my own Monster cards, I suppose, but I’d rather there be more in the game to start with. That being said, I have no problem recommending Monstrous. Adults, non-gamers, new players, and elitist gaming veterans all had a good time. And so did I. If Monstrous sounds like a game you’d enjoy throwing around, do give it try the first chance you get. Tagged Action / Dexterity Games, Ancient Games, Card Games, Child Geek Approved, Father Geek Approved, Gamer Geek Approved, Mythology Games, Parent Geek Approved, Prepublished Games. Bookmark the permalink.